Picture this. Your boat buddy has been battling a 15-pound striper for 20 minutes on the starboard side and then wham, you’re working an 8-pound Norfork Lake Walleye to the port. And then someone yells “Get The Net, NO The Bigger Net”. 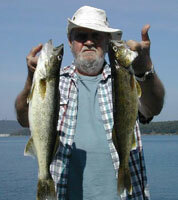 Now there’s northern walleye and there are Norfork Lake Walleye. The Norfork Lake version tends to be a bit larger, tend to fight just a little harder, and tend to have a little whiter flesh. Norfork Lake’s Walleye population has seen a dramatic increase in recent years as a result of aggressive stocking programs by the Arkansas Game and Fish Commission and the Missouri Department of Conservation along with awesome spawns. 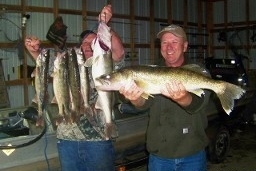 Walleye on Norfork Lake is a year round fishery. The better seasons tend to be late fall through early summer. 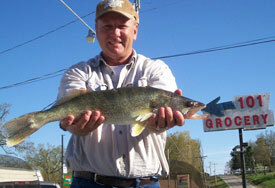 As a rule, Norfork Lake walleye go “up the river” and into the backwater rivers and creeks to spawn in early February. They return to the main lake areas starting in March. You’ll find them moving to lake channel points and flats and brush piles at that time. They roam in and out of the brush for food but like cover most of the time. Live shiners over brush piles and trolling around main lake points and gravelly flats in 25 foot of water are typically productive. 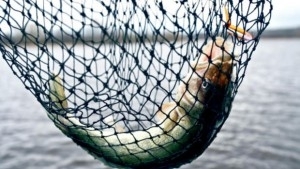 It’s common that walleye will suspend and feed on shad in May and June. These are mostly the mid-size fish. Anglers’ bottom bouncing night crawlers in 30 to 50 feet of water will usually boat these. 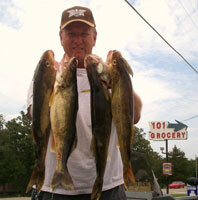 Norfork Lake Walleye will tend to go deep with the stripers as the water temperatures get higher. In the summer months, walleye tend to be lurking on the fringe of the Norfork Lake Stripers schools. Both tend to feed very early in the morning and then again in the later evening hours. You will find them deep during the heat of the day. Early morning and late evening spooning is preferred. Once fall arrives and then into the winter, trolling with live bait, jigging spoons, or casting a rogue will usually put walleye in your live well. Fishing for walleye on clear water Norfork Lake might be just a little more challenging than other fisheries. Other than your rod and reel, the best lure to pack for your trip is patience. It takes some time to master the lake conditions and recommended techniques, but the experience is worth the effort. So when planning your next walleye fishing trip, or you get that winter urge, and you don’t want to freeze your fingers off, make sure to look to Norfork Lake. You will not be disappointed. And by the way, leave your ice pick, auger and shelter at home. You won’t need them.